Graphic Novel Kid was an enemy of Comic Book Guy. After Comic Book Guy recorded sequences in which he dies, which he published on the Internet, based on famous stories, Milhouse told him that GNK (Graphic Novel Kid) has done the same, so he banished all the customers who were in his comic book store at the time. Later, when Comic Book Guy decided to enter the competition to be the new spokes-model for Lard Lad, he meets the Graphic Novel Kid, who has also has decided to compete to become the new spokes-model. The race starts, the first part involving eating as many donuts you can, followed by a bath in a hot tub of coffee and then a journey through a maze of glaze. It was a tie between them, with the jury appointing Graphic Novel Kid the winner. In addition to becoming the new spokes-model, he got a new car, that was glazed with grease. After Graphic Novel Kid drove away with his prize, his car exploded and he died. Comic Book Guy then realized how lucky he was, having not died, and decided to live life to the fullest. Later when it was discovered that Comic Book Guy was buried alive, Lisa explains that when they dug up his grave they looked at the wrong one, and they saw the Graphic Novel Kid. He did not die from a car explosion, but had tricked Comic Book Guy into the cemetery, knocking him unconscious and putting him in his own tomb. Graphic Novel Kid resembles Comic Book Guy and took over his role but killed himself by greed when he began spending the money at the auction. When Lisa queries who Graphic Novel Kid was, Comic Book Guy reveals that he was his cousin and best friend. 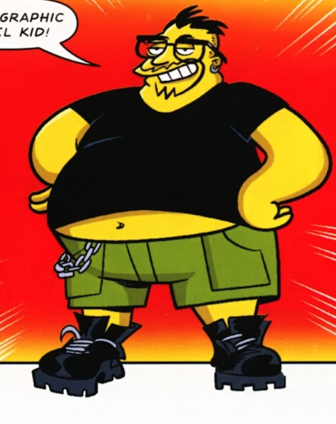 Comic Book Guy began to hate him when he bought the last copy of Radioactive Man #1 when they were young and did not let him read the issue. When Comic Book Guy came back to his store to find almost all of his comics still there, he discovers "Tales From the Vampire Warlock's Creepy Grave of Terror", Graphic Novel Kid's favorite comic book, and he discovers that Graphic Novel Kid copied the whole saga from the comic, making Comic Book Guy feel sorry for what he did when he was young. Modified on February 1, 2013, at 14:28.